Fantastic Freebies: Free Sidekickers at Arby's! Today's fantastic freebie should really hit the spot this afternoon. As part of Arby's recent Rescue Squad promotion the restaurant chain is giving away a free regular order of sidekickers! The only catch of the offer is that you need to purchase a medium drink which is practically industry standard for restaurant coupons these days. The coupon is good for mozzarella sticks, onion petals, potato bites or jalapeno poppers at participating restaurants after 2 pm through June 8th. Personally I'll take the opportunity to try out the potato bites which look very delicious, I'm sure my wife will love picking up a free helping of jalapeno poppers this week. 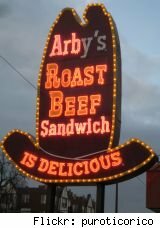 Come to think of it I wonder how Arby's will handle the situation when me and a few co workers make an afternoon run to the local store with a coupon and $1.39 for a medium coke. Rescue Squad to the ... uh ... rescue!